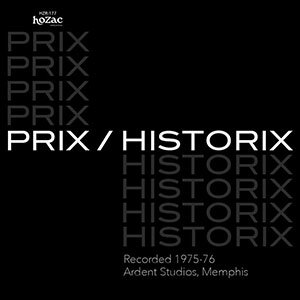 “Every time I close my Eyes” I fear this is just a sick dream, that there could really be such an incredible mid 70s power pop masterpiece like the PRIX Historix album, and that it’s really found it’s home on HoZac Archival, but yes it’s really happening. What very well might be the most overlooked and unusually obscure offshoot of the Big Star family tree, PRIX started off after Tommy Hoehn and Jon Tiven had done time in the last version of Big Star, with Hoehn contributing to the final Sister Lovers/3rd LP, and Tiven filling out the last live version of the band on their 1974 tour. The pair found themselves in 1975 looking for a new project as Tommy had sent in demos to Tiven, as well as having been called up to perform backup work on Tiven’s production with Chilton’s 1975 Bach’s Bottom LP. Hoehn would sing backup on the Chilton songs on the Chilton recordings and vice-versa on the PRIX recordings as they cross-pollenated a batch of songs that are best represented here on Historix than anywhere else. Chris Bell was roped in for production as well as guitar & backup vocals and with Rick Clark added in on bass, they headed into the legendary Ardent Studios in Memphis to cut the recordings contained on this LP. Soon enough, this studio group made up an incredible collection of songs that would fluidly fade across projects, from all parties involved, very quickly in this especially creative mid 70s period, resulting in some of the most powerful rock’n roll of the 1970s, and that’s REALLY saying something. PRIX is all about Tommy Hoehn’s vocals, right on par with Chris Bell, if not even more ballsy, fluttering between beauty and the beast effortlessly, every bit as much of a skull-crusher as it can carry a lullaby, the most potent weapon in the PRIX arsenal, let’s just get that out of the way first. “How have I never heard this?? This sounds like Bon Scott fronting Big Star” has been the usual interpretation when fresh ears are torn open with such intimidating force upon first exposure to “Run, Run Away” and “Take Me Home and Make Me Like It,” both of which were deemed too demonic for the production touch of Chris Bell, who could feel the devilish raucousness seeping through the grooves. Jon Tiven scorches on the guitar across the whole album, reeling in savagely powerful riffs, jutted head-first into drop-dead gorgeous bridges & breaks that will instantly own your tattered soul, but that’s not all. Across the album we’re treated to an impeccable group of cameo appearances, from Hilly Michaels (Sparks, Peach & Lee, Van Duren), the inimitable Jim Dickinson, and various other Memphis pop underground luminaries, which really provides a vivid portrait of the times. After I finished the Alex Chilton recordings which became known as Bach’s Bottom, your humble producer flew back to New York to make the rounds of record companies, and at that time there was zero interest in Alex or these tracks. In fact, there was very little happening on the record scene at all in late 1975—the punk/new wave scene was strictly a club phenomenon and there weren’t even indie labels putting out their music, never mind majors. 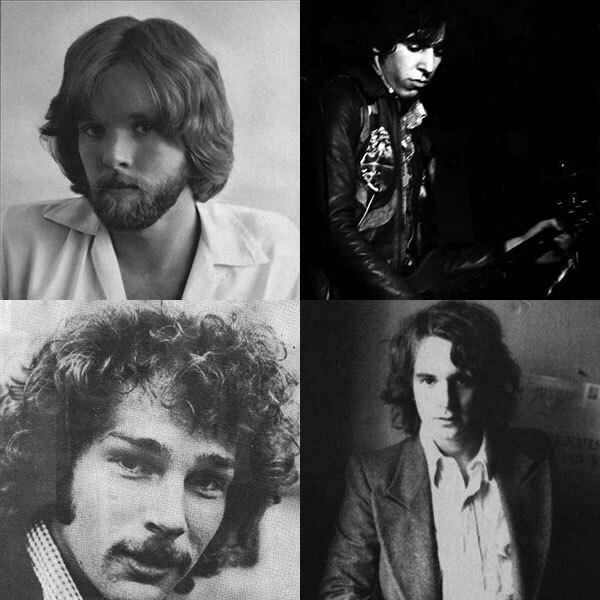 I chose to return to Memphis, ostensibly to join a new band formed by several Big Star alumni and friends of mine—Chris Bell, Jody Stephens, and Van Duren—on Van’s invitation. By the time I moved to Memphis, however, Van had added Mike Brigardello, who was doubling on guitar and bass. Although I did rehearse with them and play a few gigs (including a Big Star reunion with Alex Chilton and Andy Hummel augmenting the rest of the band) there wasn’t really room for me in the group so it was time to find something else to do. Previous to recording Bach’s Bottom, a young singer/songwriter had sent me a tape which seemed fairly promising, although a bit lightweight. His name was Tommy Hoehn, and I had called him and his buddy Rick Clark to do some backing vocals on the Chilton sessions. We talked about working together then, but my priority was Alex at that time. Three months later, the Bach’s Bottom tapes seemed like a dead issue, and Alex’s interest in pursuing a career in music was nil. Tommy and I sat down and talked about putting together a band. Rather than do a live thing, we decided that we’d use the recording studio as our woodshed, pooling various songs both of us had started working on already. We asked our friend Chris Bell if he would serve as co-producer, and he was very enthused about it—he liked Tommy’s voice, and he was becoming frustrated trying to find a record deal for his own material. Tommy idolized Chris, and they had spiritual interests in common, so it was a very stimulating combination of creative individuals. The three of us came up with a whole slew of tracks over a six month period, pulling in friends to help on the project where necessary. Chris had a problem with some of the songs being what he termed “devil music”—Chris was a very devout Christian—so he absented himself from “Zero” and “Take Me Home & Make Me Like It”. Producing with Chris was a very powerful experience and the excitement he brought to the songs he actively was involved with spilled over to the rest of the sessions, particularly “Love You All Day Long” which has his fingerprints all over it. I flew back to New York at the end of the summer of 1976 to try to drum up some record company interest, and surprisingly enough we had one firm offer from Mercury. Within weeks, Columbia had put in their bid to fly the rest of the band from Memphis to audition—the feeding frenzy was on— and it looked like Prix was destined for greatness.This is where things started to fall apart—Tommy came up by himself, as his chosen drummer chickened out at the last minute. I found a substitute in Vic Steffans, put my old friend Doug Snyder on bass, and the makeshift band rehearsed in my parent’s garage in Connecticut for two weeks before showcasing for the A&R honchos in the CBS recording studios. The performance was musically inspired, but there was no stage show to speak of, and CBS chose to offer us a singles deal, which we refused. Shortly thereafter the A&R person at Mercury got cold feet, and that contract—which was already in its third draft—was withdrawn. By this time I had played the tapes for Terry Ork who was attracted by the same aspects of Prix which gave Chris Bell the willies—he liked the devil’s music, to put it mildly. Ork was anxious to put out the Prix material at the same time as the Chilton stuff and book us into CBGB’s and Max’s. All of this sounded fine to me, so I went with it to get the band up and running. Tommy, however, was not prepared to pay dues in New York, and without warning flew back to Memphis just as the single was issued and the buzz was starting. He had seen a mouse scurrying around his hotel room (the Chelsea Hotel—what a surprise!) and beat it back to Memphis in a hurry. There were artistic differences between us as well,with Tommy’s preferences being on the Badfinger/Stories/Raspberries pop axis while I thought his voice would work best with a more muscular backing behind it. He went on to make a couple of solo albums for Powerplay (and London) Records that reflected his artistic sensibility. Our group was kaput, but I did manage to get one additional single, “Saturday’s Gone” released —not for any reason other than I thought it was a good piece. Years later, I found myself in England on a songwriting trip and went into a collector’s record store to find my Alex Chilton EP on the wall for fifteen pounds (almost thirty dollars), and I was curious enough to ask the proprietor if he liked the record. He told me he did, and I let him know that it was my production. At this point, he started to rhapsodize about Prix —“The Chilton stuff is good, but that Prix EP is magical!” Recently Rhino records chose “Saturday’s Gone” to be on a sampler of late Seventies power pop, so I guess we reached somebody. At the time, it was hard to tell if anybody noticed. For the purposes of making this recording as interesting as possible, I have dug up the tapes of our CBS audition and restored them with minimal overdubs. In resurrecting these tapes, I have tried to keep the spirit intact, so please keep in mind that pitch is not an absolute science, and if there’s a sonic world of difference between “She Might Look My Way”/”Run Run Away” and the rest of Historix, all I can say is I did my best to preserve the vibe. by John Siket, assisted by David Voigt. Special thanks to Dennis Ferrante.